Self-confessed “worshippers of the noble porker” Nick Coleman and Andrew Allen met at university. Several years later they found themselves stood in front of the infamous dragons from BBC hit show Dragons’ Den. Started as a bet between co-workers their innovative snack manufacturing business has become a runaway success. Co-founder Nick told us their story, from start-up to a thriving brand stocked in nearly a thousand pubs. Can you tell us a bit about yourselves and your backgrounds before starting your own business? We both met about 11 years ago while studying at Aston University. I was studying business and Andrew was studying product design. Both Andy and I had a love for the student guild and were lucky enough to be elected to run it for a year – one of the best years of my life. It was a great learning environment and we got to spend a year living and working with our mates. It was this year that I started to get a flavour of what it could be like to run my own company. But I knew I needed some more experience, so headed off to work for Marks & Spencer and then BMI Healthcare for a few years. 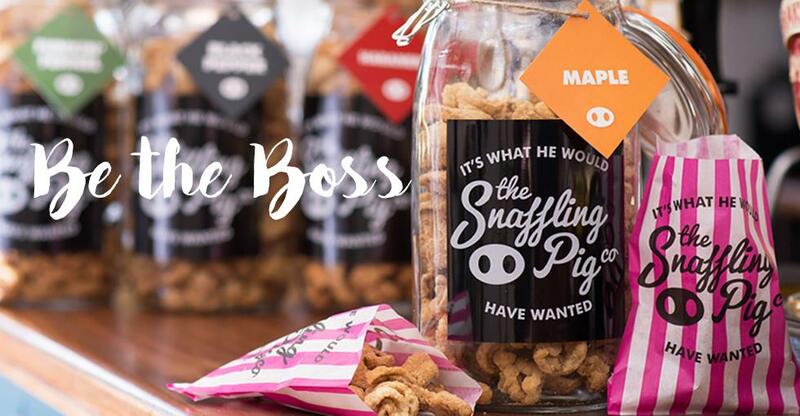 What’s the story behind The Snaffling Pig Co – how did it all start? Six years ago I co-founded a medical supplies business called Medical Supermarket. Four years into this journey I had a bet with my co-founder, Udhi Silva, that I could turn a £500 investment into a multi-million-pound company. I wanted to build a consumer food brand and focused on the times of my life where I have had the most fun: down the pub having banter with my mates. I knew the craft beer market was in massive growth, but there didn't appear to be a snack that complemented the movement. Pork scratchings were the obvious choice and innovating them seemed the logical answer. That's where double cooking and flavouring came in. With my background in business I had the sales and operational parts covered but I was lacking in marketing knowledge. That's where Andrew came in. He had left uni to start his own digital agency and had all the experience we needed to make our piggin' dream a reality. Two beers down and a taste of the product and he was already thinking about how to lay out the brand. We now sell over 10 flavours to 900 pubs and fine-food shops across the country. Launching a gift range with Not on the High Street helped cement our brand as a premium snack provider and we are working hard to gain listing with all the innovative pub groups. We branched out into brewing our own beer last month and now offer this as part of a gift pack or on its own. Can you tell us a bit about your experience on Dragons’ Den? Wow, what an experience that was! Unlike anything I have ever faced or ever will. I've watched the show since day one and I can tell you everything you see on TV is real. There is a lift and you do walk out of it seeing the dragons for the first time. They have no idea who you are and you have no chances to film retakes or answer differently. They can ask you anything and everything and they pull no punches. No matter how much you prepare, there will always be a question that stumps you and honesty is the only option. There is no point trying to make it up; you just have to tell the truth. Because first and foremost Dragons’ Den is a TV programme the BBC have the right to edit however they wish and your business can be a victim of a harsh edit. On TV I appeared stumped by a fairly basic finance question about my overheads, but in the actual Den the question was directed to my 2019 forecasted P&L and I couldn't remember my rent and salary projections three years from then. I take it on the chin as it's all part and parcel of being on the show. Half of our turnover comes from the gifting market and we entered the Den wanting an investment from Nick Jenkins. When we agreed the deal it was hard to contain our excitement as he has the skills we need to take our business to the next level. We entered the due diligence phase and signed on the dotted line in July. He and his team have been great to work with and, most importantly, share the same passion and excitement for the brand that Andrew and I do. It was really important for us to have an investor who understands what we’re trying to do and wants to support us on that journey. What challenges have you encountered along the way and how did you tackle them? Owning your own business throws up new challenges each and every day and that's why I love what I do. Working in the corporate world is too restricting and you rarely get the chance to make mistakes and learn from them – which is why I made the leap in the first place. I've had to pick up skills in sales, finance, people management, operations and IT and I try to surround myself with people who are far greater in these roles than I ever could be. Growing pains are good problems to have, but if not nipped in the bud quickly they can ruin you. Cash flow, product quality and service levels are all on a slippery slope and must be managed carefully and planned. Do not underestimate the power of nice, steady, organic growth; it has helped us learn from our mistakes without many people knowing about them! What advice would you give to other small-business owners? Don't start a business to make money. Love what you do and the money will follow.